The Pumper at Kingston Mills The only known image of the Rideau/Pumper shows it working at Kingston Mills. Only the front half is visible. The 12 hp steam engine on the ship is being used to power a water pumping mechanism. 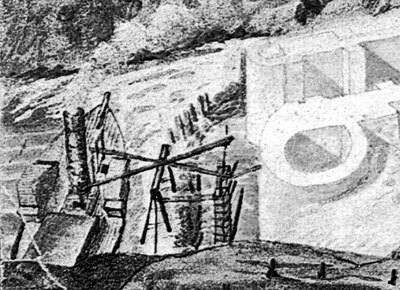 A portion of a watercolour painting: “Kingston Mills: Masonry of three lower locks completed, Steamboat "Pumper" at lock entrance”, by Thomas Burrowes, c.1830. Archives of Ontario, C 1-0-0-0-72. We’ve just completed the 182nd year of continuous operation of the Rideau Canal. The Rideau Canal is a UNESCO World Heritage Site in part because of that fact – boats travelling along it today represent a heritage that goes back to when the first full steamboat transit of the canal was made in the spring of 1832. History attributes that honour to Robert Drummond’s paddle wheeler, the Rideau, aka the Pumper. We’ll take a brief look at that trip and the boat that did it. If Colonel By’s original recommendation for a larger lock size had been accepted, a different boat, one named the John By, would have had the honour of making the first full transit of the canal. By’s initial recommendation was for the locks to be 150 feet long with a minimum navigation depth in the channel of 10 feet. His bosses in Ordnance wouldn’t go for that and he was quickly forced to revise his request to the original Ordnance plan of a minimum 5 foot navigation depth. In 1831, Robert Drummond, together with a few other shareholders, had the John By purpose-built for the Rideau Canal – it was 110 feet long by 33 feet wide, to just fit into a Rideau lock. It sported a 75 hp low-pressure steam engine and was intended to draught only 3.5 feet. At the time, ship building was mostly an empirical science, and the actual draught of a ship wasn’t known until it hit the water. When the John By was launched, its draught was more that 6 feet, so it couldn’t be used on the Rideau Canal. It was now the spring of 1832, and work on the southern locks was essentially complete. The northern locks had been completed the previous fall, the steam boat Union (built in Hawkesbury in 1822) having already made trips as far south as Smiths Falls by November, 1831. But By wanted to celebrate the completion of his triumphant first trip by steamboat in Bytown and that meant starting from Kingston using a ship in that location. 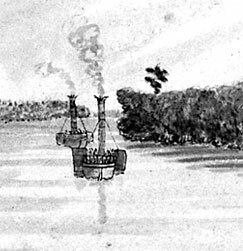 Although Drummond intended the John By to be that ship, he had a second steamboat available, one already on the Rideau Canal. That second vessel was his steamboat Rideau, nicknamed Pumper for how it was being used. The 80 foot long by 15 foot wide paddle-wheeler with its 12 hp steam engine was launched, as the Rideau, in Kingston, on June 6, 1829. Shortly after that it was pressed into service at Kingston Mills, to pump out water from behind the coffer dam protecting the lower lock. The only image we have of the Rideau/Pumper is a c.1830 painting showing it being used in this capacity. It is identified in the painting as the Pumper. At 6 am on May 25, 1832, the Rideau/Pumper arrived in Smiths Falls. The locals were enthusiastic to the point of firing a large 18 pound cannon in salute to Colonel By. That lasted until they loaded the cannon with 10 pounds of gunpowder, tamped some sod into the barrel and lit the fuse. The cannon blew up, parts of the barrel travelling up to 425 feet away (no one was injured). On May 29, 1832, the Rideau/Pumper arrived in Ottawa. But that wasn’t the actual public opening of the Rideau Canal. Just a couple of days after travelling through Upper Brewers, a mill dam broke on Loughborough Lake (near today’s Battersea), the resulting flood water taking out a coffer dam at Upper Brewers. In addition, Colonel By noted that some of the iron work had broken on some of the locks and in a letter dated May 30, 1832 stated that he hoped the canal would be open to the public in 18 to 20 days. The Rideau/Pumper is credited with the first commercial trip along the entire line of the Rideau Canal when it left Kingston for Bytown on July 12, 1832 carrying 200 barrels of flour, 60 barrels of pork and an unknown number of passengers. What happened to the Rideau/Pumper? We know that the Rideau and Pumper are the same vessel and that it was the first steamboat to make a full transit of the Rideau Canal, in May of 1832. The question then comes up, what happened to it? This is where it gets a bit confusing. Some researchers have conclude there were two vessels in 1832 named Rideau. That’s because some newspaper articles referred to Drummond’s “new boat, the Rideau” either being built and/or receiving a engine in Merrickville in 1832. So, taking newspaper reports at face value, and if you weren’t aware that the Pumper and Rideau were the same vessel, one conclusion is that Drummond had a new ship built in 1832, exactly the same length, with a wider width, and with the same name as one he already had. That’s an unlikely scenario. Much more likely is that Drummond had the Rideau/Pumper widened for the commercial cargo and passenger trade and fitted with a new engine in 1832. We know that in 1833 it was made 15 feet longer, presumably to be able to carry even more cargo and passengers. Up until 1840, we see mentions of a steamboat called the Rideau, including a reference to a boiler explosion that killed 2 men in 1838. These mentions are likely the Rideau/Pumper. 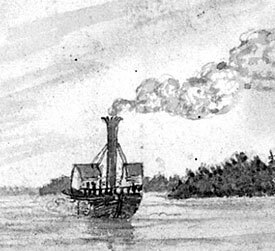 One source has the boiler explosion being the end of the Rideau in 1838, but another has that in 1841, with its service life as a steamboat over, it was rebuilt as a barge. The John By had a short service life on Lake Ontario and the St. Lawrence. It was wrecked near Port Credit in October 1833. The Union, poorly designed (“not noted for obeying her helm”) and laid up from 1829 to 1831, was used on the Rideau Canal for less than 3 years. It was retired from service in 1833. Rideau/Pumper? Is one of these steamboats, in portions of two paintings by Thomas Burrowes, two near Beckett’s Landing c.1835 (left) and one near Oliver’s Ferry in 1834 (right), the Rideau/Pumper? 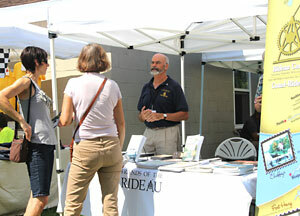 Hunter McGill chats with visitors to our booth at the Rideau Ferry Regatta this summer. We hope you had a good season on the Rideau. Judging from the visitor numbers at the Depot in Merrickville, more people were coming to see the Rideau Waterway than in previous years, though fewer by boat. It is always a pleasure to welcome first-time visitors and to encourage them to explore the entire Rideau and discover what a fascinating and important part of Canada’s history it represents. Several of us on the Board of Friends of the Rideau had the pleasure of travelling to events along the Canal during the summer, carrying the Friends’ banner. We had a lot of enjoyment taking part in Colonel By Day in Ottawa, the Manotick Classic Boat Show and the Rideau Ferry Regatta. It was an interesting season on the Rideau Waterway in 2013. There was much worry before the navigation season opened, especially regarding hours of operation and fees, which may have contributed to the impression many people had that the Rideau Canal would not in fact be operating in 2013. As you know from our spring newsletter, Friends of the Rideau has been urging the federal government to minimise the impact of budget cuts to the Rideau Canal and to re-commit to the preservation, protection and presentation of the heritage of the Rideau. Many other voices were present in this chorus of concern and some relief was achieved in terms of a freeze in the plan to dramatically increase fees. But we must continue to be vigilant and remind government leaders at all levels that the Rideau is the oldest continuously operating canal in North America and that preserving its outstanding universal value to humanity, as noted in the UNESCO World Heritage designation, is our shared responsibility. Friends’ Board has met with Darlene Upton and Jewel Cunningham, the senior managers of Parks Canada’s historic canals and the Rideau Canal respectively and we look forward to working with them in identifying and developing ways to preserve, protect and present the heritage of our Waterway. We hope that opportunities will present themselves as Parks Canada moves ahead with preparation of a management plan for the Rideau, and with measures to protect cultural landscapes along the Waterway. If you have ideas you would like us to consider as we shape our partnership with Parks, please write and let us know. In closing, the Board of Friends of the Rideau thanks you for your support through your memberships and donations in 2013. We look forward to seeing you in 2014 and working on behalf of all who believe the Rideau Canal and the Kingston Fortifications represent key elements of our shared heritage. The Friends of the Rideau AGM took place on May 11 in the theatre of the Rideau Canal Visitor Centre in Smiths Falls. Our Chair, Hunter McGill, welcomed everyone and introduced the Director for Ontario Waterways, Jewel Cunningham, together with the new Executive Director of the Ontario and Quebec Waterways, Darlene Upton, and the Director of the Quebec Waterways, Luc-André Mercier. Hunter provided an outline of our many activities during 2012. He also informed the members that, as a charitable organization, we have to make sure that our activities stay within the bounds of the rules for charitable and not for profit organizations. However we can advocate for our cause, the natural and cultural heritage of the Rideau Canal, and will continue to work towards that end. The large changes that took place on the Rideau this past year meant that we had to say goodbye to many friends and former staff members of the Rideau Canal. Hunter also acknowledged and thanked the Village of Merrickville, the Province of Ontario Ministry of Tourism, Sport and Culture, and the federal Canada Summer Jobs program, for grants received in 2012. Elections for members of the Board of Directors for 2013-2015 were held and Rowena Cooper, Cheryl Gulseth, Brian Osborne and Jo MacFadden were re-elected as board members of the Rideau Waterway Coordinating Association (Friends of the Rideau), for a two year term. The featured speakers were Jewel Cunningham and Darlene Upton who did a special presentation on the Rideau Canal system. Darlene Upton started by describing what the Waterway Unit is, and where it is going. She voiced hope for a strong future for the Rideau Canal. Prior to this there was no specific unit devoted to canals in Parks Canada so the creation of the unit, which comprises seven of the nine historic canals and waterways operated by Parks Canada, should mean a stronger voice for canals within Parks Canada. Darlene’s office will be looking after capital planning, dam safety, economic development and human resources. Jewel Cunningham spoke about the daily lock operations, the ongoing maintenance of all the waterways, water management, cultural and natural resources management, external relations, visitor services, and realty. Jewel described the public discussion that took place prior to making changes to the hours of operation. She also said that Parks Canada was fully committed to participating in Colonel By Days at the Ottawa Locks in August. She described various heritage presentations and a promenade project consisting of an 8 km walk from Hartwells to the Ottawa Locks. She also described integrating history by the use of smartphone apps and utilizing the museums in Smiths Falls and at the Ottawa Locks. She finished by telling us that Parks Canada was going into partnership with Google Maps on a national scale. Darlene then continued by looking to the future and where the Rideau Canal will go from here. Darlene is anxious to work in partnership with other groups along the canal to foster recreation, tourism and economic development. She will be starting conversations with all the groups along the canal and will need feedback. There were extensive questions throughout the presentation with members and friends voicing many concerns about Parks Canada and the management of the Rideau Canal. Following the conclusion of the program, Jewel, Darlene and Luc-André, continued the conversation and answered many further questions about the future of the Rideau Canal. The 2013 lockage numbers are in with a total of 56,750 vessel passages. This is down over 11% from 2012 which had 64,010 vessel passages. This is the lowest number in over 30 years and is part of a steady decline since 2009. The reasons are many; including the recent uncertainly over Rideau fees, reduced hours of operation, lack of marketing to boaters, and shifting boating patterns that are not being adapted to. We had a good season operating the Depot in Merrickville, welcoming over 5,400 visitors during our 10 week season (up from 4,500 in 2012). The Depot is our main physical presence on the Rideau and helps to serve our mandate of informing the public about the wonders of the Rideau Canal. We’re grateful to the Village of Merrickville for financial support to help extend the time we were able to operate the Depot. Friends also receive support through the Canada Summer Jobs program of the Federal government to hire a student for the summer period. A great big thanks to Cheryl Gulseth, who kept the Depot very well managed. Also big thanks to Harry Hitsman, our summer student, who did a superb job. We also had excellent volunteer help from Charlotte Hitsman, Nick Hitsman and Danny Proulx - a big thank-you to all. This year we expanded our partnership with Ted Hitsman of Canal Tripping in Merrickville, facilitating canoe and kayak rentals from The Depot, in order to get people out on the water, allowing them to fully experience the Rideau Canal. This worked out extremely well and contributed to our increase in visitation. We look forward to continuing this service in 2014. Rideau Canal Brigade Paddlers from the Voyageur Brigade Society, paddle through "The Quarters" on their way from Jones Falls to Davis Lock. 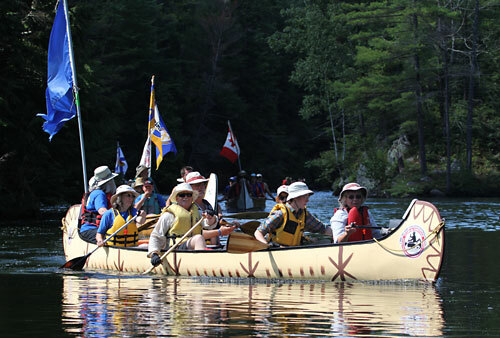 This was the first in series of canoe brigades planned for the Rideau Canal leading up to a major rendezvous of paddlers in Ottawa for the 150th celebration of Canada in 2017. How Long to Paddle? It is said that the first trip Colonel By took along the Rideau Route in 1826 took only 3 days. He was using French-Canadian voyageurs who started their days at the crack of dawn. Today it is recommended that paddlers plan for 6 to 10 days in order to experience a leisurely paddle and take in all the Rideau has to offer. A series of tourism workshops were held in October as part of a visioning exercise for the Rideau Corridor. Press releases from Parks Canada concerning the process stated that it is “to Enhance the Financial Sustainability of the Rideau Canal” which is incorrect, this initiative is about tourism in the Rideau Corridor, not about the financial sustainability of the Rideau Canal, which remains a critical issue, not addressed by this process. This tourism initiative is being done by the Rideau Partnership Group, which includes Parks Canada, the Rideau Roundtable, the Rideau Heritage Route Tourism Association, the United Counties of Leeds and Grenville, Lanark County, the Town of Smiths Falls, and the Valley Heartland Community Futures Development Corporation. The process is a visioning exercise, as one person put it, “it is blue sky, not blueprint” – a solicitation of tourism ideas but not the methods about how they might be financed and implemented. Each two-day workshop brought together a group of about 12 people, a mix of tourism business operators, individuals, representatives of NGOs involved in the Rideau Corridor, and members of tourism associations. The workshops were based on a program called the “Visitor Experience Opportunities Concept,” in use by Parks Canada since about 2006. These workshops were to be part of a larger program which was to include a “broad engagement of the general public,” but that part doesn’t seem to have gotten off the ground. There is also supposed to be a series of public feedback meetings to discuss the results of the workshops. The has been no word on when those will take place, presumably sometime in early 2014. Feedback from non-government individuals who took part in the workshops can be categorized as sceptical. While the concept of enhancing tourism in the Rideau Corridor is laudable, what took place is simply a process to solicit tourism ideas based on a specific tourism model. It will all boil down to implementation. Most of the ideas are not new – they’ve been heard in previous Rideau Corridor tourism initiatives – the devil is in the detail of how to finance and implement those ideas. That remains a huge hurdle on the Rideau. A point raised by various heritage people attending these meetings is that key to the success of any tourism initiative in the Rideau Corridor is the state of the Rideau Canal – its maintenance, its operation, its appearance, and its heritage interpretation. That will require a commitment on the part of the Government of Canada to properly finance the canal and to fully meet UNESCO’s World Heritage requirements. Many great ideas were put forward – it is hoped that there will be a government commitment to support them. It is with great sadness that we have to advise of the sudden passing of David Hammonds on September 10, 2013. David was very active with the Merrickville and District Historical Society, was a founder of Friends of the Merrickville Turbine and was a true friend of the Rideau. David, a Civil Engineer, moved to Merrickville in the early 2000s. He and his wife Gillian became very active with the Merrickville and District Historical Society, becoming members of the executive committee and then took on the daunting task of Blockhouse managers. David also worked hard to preserve the turbine (first used in 1915) located in the Industrial Heritage Site in Merrickville – helping to tell the story of power generation on the Rideau Canal. David’s enthusiasm for the heritage of Merrickville and the Rideau Canal will be greatly missed. Friends of the Rideau was honoured to receive donations in memory of Marshall A. Crowe, distinguished Canadian public servant, who passed away in August. After his illustrious career, Mr Crowe lived close to the Rideau Canal on his farm near Portland, where he helped introduce Dexter cattle to Canada. We thank the family for their thoughtfulness. Those of us who live or cottage along the shorelines of the Rideau Canal know the value of maintaining water quality and shoreline habitat. There are many individuals and lake associations that work hard to achieve those ends. Now there is a new tool to help out with this, the Love Your Lake program. This program provides resources and training to local organizations to deliver an engaging and effective program to help landowners protect and restore their shorelines and improve the health of their lake. The lakes of the Rideau Canal are host to a healthy loon population. The haunting calls of this iconic bird serenade our lakes throughout the summer. Water clarity is easily measureable by using a device called a Secchi disk. While not a direct measure of water quality, it serves to indicate changes over time. In the case of Sand Lake on the Rideau Canal we can see a great improvement since the early 1970s, a measure of effectiveness of various environmental regulations and local environmental initiatives. The thick black line is a moving 5 year average that shows a fairly continual improvement. The jump on the chart in the early 2000s represents the invasion of zebra mussels. The drop in 2011 was a collapse in the zebra mussel population. Those populations have now stabilized leading to a rebound in clarity.